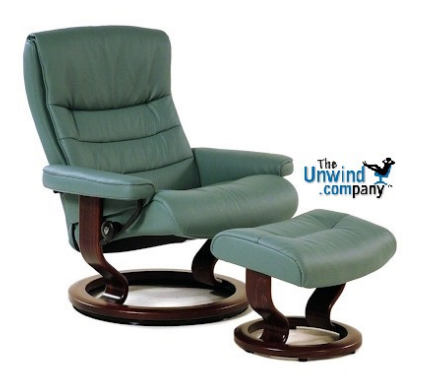 Pickup a Great Deal on a New Stressless Nordic Medium Recliner with Ottoman. Now is a great time to save big on the beautiful Nordic Recliner and Ottoman by Ekornes. Only a few available with special pricing from Unwind. Enjoy Fast, Worry-free Delivery on a Stressless Nordic Recliner Medium with Ottoman. Got an accessory on your mind? Why not add a laptop table to your new Stressless Nordic recliner? We have a few discounted laptop table colors in stock in our Ekornes Authorized Price Reduction inventory. These include Mahogany, Cherry and Natural. Call or chat for discount pricing. Start relaxing in your beautiful new Nordic Medium recliner sooner with our Quick and Easy Shipping Methods. It's a great time of year to purchase from the amazingly comfortable, Stressless Nordic line! This popular, modern recliner delivers exquisite head, neck and back support and the over-stuffed smooth, soft, cushioning allows you to sit undeterred for many hours on end. The Stressless Nordic Medium recliner is among the newest Stressless recliners available. Looking to add a matching Stressless Sofa, Loveseat or Sectional? You’re in luck as the Ekornes Paloma Specials Sale Colors are also eligible for additional savings under this promotion. You receive Paloma Special Pricing Colors at Batick Special Pricing levels and Batick Special Pricing Colors at $100 off their regular pricing. These deals can save you $1000’s. Simply choose your matching Batick or Paloma leather sofa or sectional model and watch the savings stack up! Have Questions or Prefer to order via phone? Drop us a line at 888-486-9463 or 1-601-932-5111 (Internationally). View our Blog to learn about what’s new and exciting in detail or drop our Ekornes Brand Specialists a line at 888-486-9463. They can explain the specifics of each product and help direct you to money-saving opportunities. We aren't a furniture store. We provide the latest in relaxation products in an effort to promote a reduction in stress for our customers and friends. There are no hassles or haggles at Unwind. There is simply good people trying to get you the furniture your body needs at the best prices allowed. Our President makes sure that each and every team member at Unwind is wholly focused on providing the best Customer Service available. We want more than customers. We want to help promote a healthier lifestyle overall. These chiropractic approved furniture items are a great way to make every seat in your home back-friendly. It is a great time of year to purchase the amazingly comfortable, Stressless Nordic recliner! This ultra, high-end recliner delivers exquisite head, neck and back support and the over-stuffed smooth, soft, cushioning allows you to sit undeterred for many hours on end. The polished, steel base insures your recliner will last for many, many years! Stressless (Medium) Nordic Recliner and Ottoman by Ekornes- A cool addition to the back-healthy Ekornes product line. The Nordic Recliner builds upon classical Stressless Strengths and expands our understanding of comfort technology. The new 2015 Cori Leather is a show-stopper. The increased tip shine and textural depth provides a rich, dramatic colorization. The texture is so unmistakeably 100% Premium Top-Grain Leather. 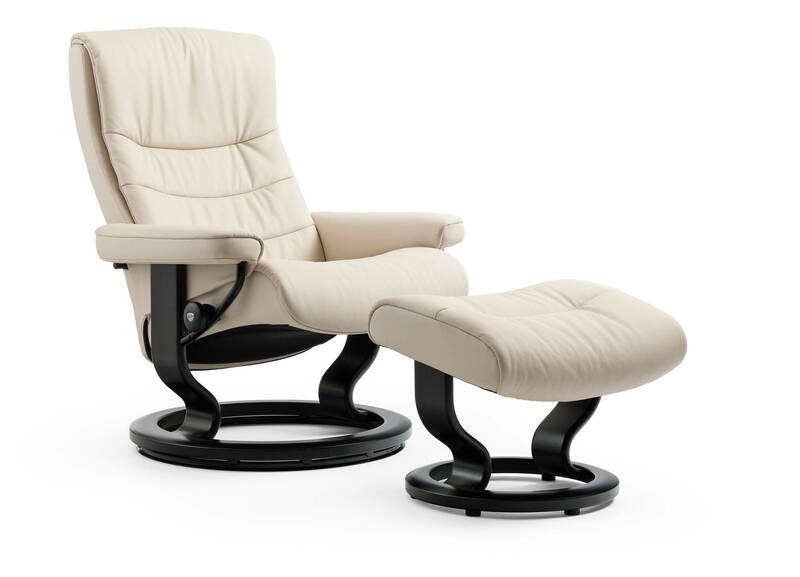 Many of your classic favorites like the Stressless Mayfair are stocked in select Cori colors. Call 888-486-9463 for the latest information about this and more. This model is guaranteed to hit the spot. It is ultra-sleek, made from the finest materials and backed by a 10 Year Warranty directly from the manufactuer. The beauty of Ekornes isn't just in their exquisite designs, remarkable colors, and slew of options. It's in their willingness to stand by their product. Not only does Ekornes claim this brand of furniture can enhance your comfort and overall well-being but they stand by their products firmly with a 10 year warranty. This 10 year warranty comes at no extra cost to you. 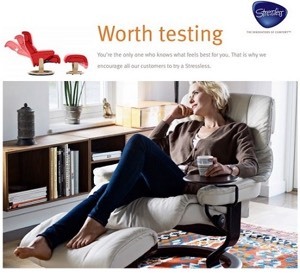 Ekornes is so confident because they know that when it comes to Stressless, they have "got it right". There are 4 different leather grades and many different fabric types to provide choices that suit every lifestyle and preference imagineable. The Cori Leather and Ultrasuede options will be available for these new Nordic Recliners, the Metropolitan & Panorama Sofas, and the Skyline and View Recliners. If you would like to learn more about the varying leather options, click here: Leather Descriptions and Explanations. The Nordic model is structurally similar to a Sunrise Recliner with Ottoman. It is a compact seat that leaves a minimal footprint in your room. The thick padding is cleverly disguised as styling. Once you sit down in this model, you will be through wondering which is the most comfortable Stressless Recliner.